When Bob Quinn was a kid, a stranger at a county fair gave him a few kernels of an unusual grain. Little did he know, that grain would change his life. Years later, after finishing a PhD in plant biochemistry and returning to his family's farm in Montana, Bob started experimenting with organic wheat. In the beginning, his concern wasn't health or the environment; he just wanted to make a decent living and some chance encounters led him to organics. But as demand for organics grew, so too did Bob's experiments. He discovered that through time-tested practices like cover cropping and crop rotation, he could produce successful yields — without pesticides. Regenerative organic farming allowed him to grow fruits and vegetables in cold, dry Montana, providing a source of local produce to families in his hometown. He even started producing his own renewable energy. And he learned that the grain he first tasted at the fair was actually a type of ancient wheat, one that was proven to lower inflammation rather than worsening it, as modern wheat does. Ultimately, Bob's forays with organics turned into a multimillion dollar heirloom grain company, Kamut International. 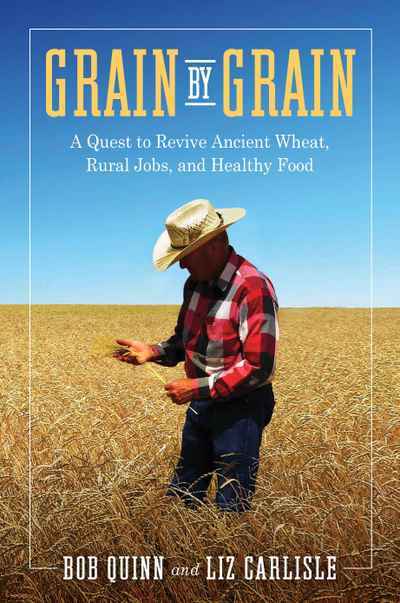 In Grain by Grain, Quinn and cowriter Liz Carlisle, author of Lentil Underground, show how his story can become the story of American agriculture. We don't have to accept stagnating rural communities, degraded soil, or poor health. By following Bob's example, we can grow a healthy future, grain by grain.